Maria Baena Clarke/Baena Wedding "Having Gene Cannon in our wedding was a complete and utter treat. Not only did his presence provided a touch of elegance through his live music, but his demeanor and willingness to please our every need and wants made him extremely pleasant to having him play in our wedding. Gene, you are the best!" Devon and Jaclyn Johnson Johnson/Hughes Wedding "What can we say....you made our wedding night one we will never forget. Our guest had so much fun and were even willing to pay for an extra hour! They didn't want the party to end! It was amazing to have a sax player, singer, guitar player, and a DJ all included in one price! It was not easy for us to find one person who was as talented and easy/enjoyable to work with as you Gene. We want to thank you for making our wedding night one we will NEVER forget. Anybody who needs an artist for their event we will not hesistate to pass your name along. Thanks!!! Devon and Jaclyn P.S. Expect a call from us to play at our 10 year vowel renewals!!!!!!!!!!!!!! :))"
Clearwater Yacht Club/ Marcia Nichols "My husband Hoyt Nichols is Rear Commodore and Chair of Entertainment (I am Co-Chair) this year at Clearwater Yacht Club in Clearwater Beach, Florida. 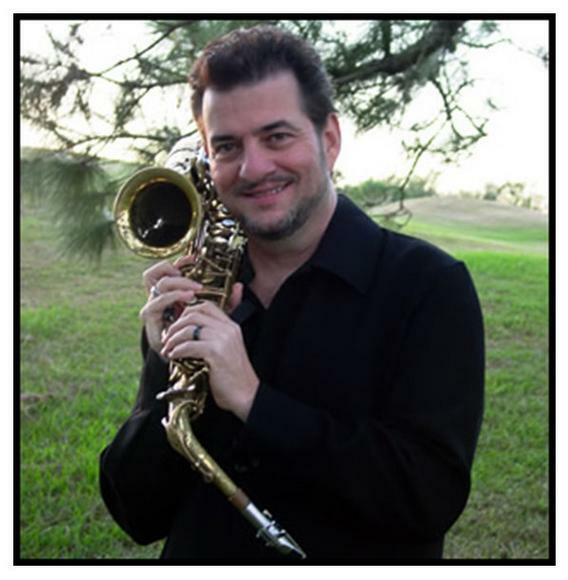 We were very fortunate to book Gene to play for us on several occasions for our club’s Wednesday Jazz Nights. He is simply a great, cool musician. He can do it all! Sings, handles the sax and flute with much finesse and talent and plays some really great Smooth Jazz. Our members certainly enjoy listening to him as he really interacts with the audience and makes everyone relax and sit back and enjoy the music. We recommend him for any venue. He can kick up several notches in tempo or play mellow. You can’t go wrong with Gene. We are looking forward to having Gene play for us a lot more times at our club. Thank you, Marcia Nichols"
Deborah L. Matera/ MetLife "Thank you Gene for an outstanding performance at our event this past Friday! Your help in finding all the sound clips and playing them at exactly the right times throughout our meeting was perfect, and enhanced our event greatly. You were easy to work with from the first phone call, were more helpful than I had expected and were very professional throughout the entire process from contract to performance. You went above and beyond and I sincerely appreciate it, and will look forward to working with you again in the future!" Cindy Helton/ Suncoast Federal Credit Union "Great Job, Gene! Thanks so much for making our event perfect. Your ability to gauge the crowd and adjust your performance to any venue is a talent. We look forward to working with you in the near future.". Andy and Lisa Tonkin Tonkin/Gonzales Wedding "We are so thankful to have Gene Cannon in our wedding. He did an outstanding job and was so easy to work with. We will spread the word!!! Thanks again!!" Donna Marie " I had the pleasure of working with Gene Cannon for a wedding ceremony I coordinated. He is very professional and quick to improvise when there are last minute changes. It was a beautiful ceremony and the sounds of the sax added the perfect touch. I can't wait to work with him again!" Celeste Sanchez/ Birthday Party "Just want to thank you again for everything that you did to make my husband’s 50th party such a beautiful and memorable event not only for him, but for all of our guests. Entertaining 100 people of such diverse backgrounds and ages isn’t an easy thing to do, but you kept everybody going all night. Planning the party was so easy to do with you. You listened to my needs, my music wants and asked all of the right questions about how the sequence of the party would go. You are such a professional! I can’t tell you how many calls I have had raving about you, your incredible musical talents and how wonderful you were. Everyone was blown away by your incredible sax playing!! I can’t thank you enough for creating this beautiful memory for us. We feel so blessed to know you and have you as a part of our lives. You will definitely be hearing from us again for all of our parties from now on! Thanks Gene, from the bottom of our hearts! You are the BEST!!!!" Danielle Findley Wedding Gene was an excellent choice for our November wedding. He did a great job selecting songs, reading the crowd, and keeping everyone happy and dancing throughout the night. Prior to the wedding and on the day of, he was very helpful in guiding us through the whole process, and was constantly reassuring and on top of things. Family and friends are still complimenting our choice of DJ. We are so happy with Gene, and highly recommend him for any event! Kristin Jones I Executive Meeting Manager I Embassy Suites - Tampa USF Good afternoon, Gene! I hope the rest of your weekend went well! I just want to touch base and say thank you for everything involving Danielle and Caleb's wedding! You are a true professional who is a joy to work with! If you ever need me as a reference, I would be honored. You stand apart from the DJ's in your industry because of your unique offerings and intuitiveness about the clientele. I have never seen a dance floor so packed with such a mixed crowd. You seriously hit the nail on the head! P. S. The fact that you called the Bride the day of her rehearsal just to assure her that everything was set on your end spoke volumes of your thoughtfulness! Danielle was super impressed! Thanks again for everything! Dan And Brandy Griffen; We were very happy with your performance/service. With the two of us just kind of winging the entire night, you had no problem adjusting to our requests and made everything seem as if it were supposed to happen at that time. The songs you played the entire night were great. If we were to ever be asked if we knew a DJ that could keep everyone happy and dancing, we would definitely recommend you. All of our friends and relatives continue to tell us how much fun they had, even the people that openly hate weddings. Thank you again for the spectacular service and we will remember the night forever. Jeanette Billy- Avon Park New Years Eve I would give Gene Cannon all 5s on the above. Gene was one of the best entertainers we have had at any of our social events in our +55 community. He made our New Year's Dance a big success. He is very talented. He plays the sax, the guitar and has a great voice. We're working on getting him back next year. All our attendees hope we are successful."